Lovely colors! That yellow sweater is on my wish list! VERY stylish girl, all three image-wonderful!Te pup!!! This coat is so you: sophisticated, with a cool edge! Love all the outfits you’ve created with it! That is such a versatile coat. Love it. I watched your blog and could not tear myself away! It’s gorgeous! You have an excellent sense of taste! A stunning style! With pleasure I will watch your new publication! thank you sweetie! we love your style ***** following you, kisses! The coat is a fabulous piece that goes with everything! LOVE that yellow sweater you paired it with!! I like all of your outfits, you look fantastic!. Kisses. My fav is the grey-red combination! The cranberry red is so beautiful and suits you so well. The grey color underlines it! Great way to switch up a look!!! There is no way that I would have noticed!!! Come visit my blog again!!! Amazing, amazing, amazing! 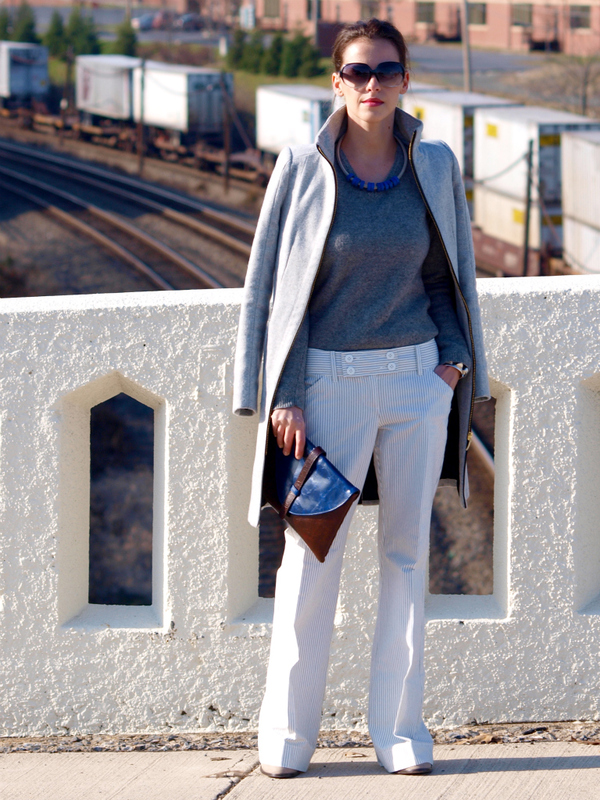 You have a really lovely blog and the blazer is just perfect! Gorgeous! You have a flawless style! Love your looks, your post and your blog. all are beautiful but grey yellow pink, my fav..
Weel,this is the proof how stylish you are-I would never tell it’s the same coat!Bravo! I love the three of them, but my favourite is the red one! You absolutely rock it , either it look chic, classic, fun or edgy . I love all color palette. great coat! I love your style! What a versatile coat, looks great on you and I love the scarf in the 2nd outfit. excellent combos.. love them all especially the red and the one with that statement blue necklace. gorgeous! Your style is amazing! I love the way you dress, your outfits look lovely on you! One word: AMAZING! Love them all. Very stylish and classy. It’s really a perfect coat. I think that it’s great that you paired the bright colours with grey ! Love your blog. Beautiful photos. Great styling. Follow each other on GFC and Bloglovin? love how you wore the coat on all 3 occasions! Hello there sweetie! Just found your blog congrats! Awesome post! You you like to check my blog and let me know what you think of it. maybe we could follow each-other? You can come and check my cooking blog 2! I like these outfits so much! This is such a cool post! I absolutely adore the grey and yellow look. Such a versatile coat! Thanks for your wishes doll! Such a versatile coat, anyway you do have a great talent in color combinations! The first 2 looks are my fav! Great new label dear!! I love all 3 combinations here, for that gorgeous presence of the colors!! three perfect looks, but I love the third, so classic and elegant!! I love how you’ve used one coat three ways, so creative :) and each outfit is amaazzing!! LOve your style! The jacket looks different in each outfit…which of course makes it even better! what a great three type of outfit.”one item looks different” is important.your outfit inspired me.